Indore-Manmad new Railway Line Project will reduce Mumbai distance by 171 k.m. A Memorandum of Understanding has been signed for Indore-Manmad, 362 k.m. 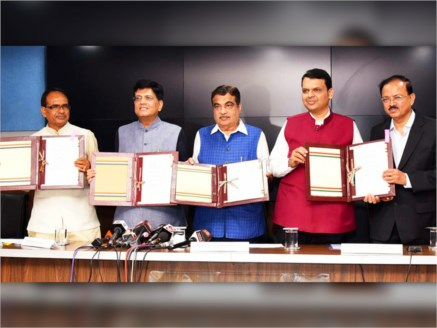 long New Railway Project between the Jawahar Lal Nehru Port Trust, Union Ministry for Shipping, Union Ministry for Railways, Madhya Pradesh Government and Maharashtra Government in New Delhi today. The project costing Rs. 8575 crore will reduce the distance between Indore and Mumbai by 171 k.m. The Chief Minister of Madhya Pradesh Shivraj Singh Chouhan, Chief Minister of Maharashtra Shri Devendra Fadnavis, Union Minister for Road Transport Shri Nitin Gadkari, Union Minister for Railways Shri Piyush Goyal, Union Minister of State for Defence Shri Subhash Bhamre and Chairman of the Railway Board Shri Ashvini Lohani were present on this occasion. The Union Minister Shri Gadkari said that trade will boost, owing to the less distance between the commercial capital of Madhya Pradesh i.e. Indore and Mumbai besides Manmad. Containers carrying goods would reach directly to Manmad and Jawahar Lal Nehru Port from Indore now. Moreover, tourism will also flourish because of the convenient commuting of the common man. The Chief Minister Shivraj Singh Chouhan has informed that this road will pass through Delhi-Mumbai Industrial Corridor-Igatpuri, Nashik via Sinar to Pune, Khed, Dhule and Nardana. This project will result in an economic benefit of about Rs. 15 thousand crores within the first 10 years of its operation. In addition, it will help in employment generation and further, it will help in reducing pollution and fuel consumption. Chief Minister Chouhan said that equity share of the Government of Madhya Pradesh or its nominated undertaking will be 15 per cent. This project will bring down logistic cost drastically for movement of cargo from the cities of North India like Lucknow, Gwalior, Kanpur, Agra and Indore, Dhule besides Bhopal region to Jawaharlal Nehru Port and Mumbai.